“More soppy, please!” came the call behind me as I dipped a large square of burlap in the wet plaster with one hand while reaching for another dry one with my other hand. “Quarter or full?” I asked, holding out both options. My co-worker took one and I gave the other to yet another waiting hand. I quickly turned around, trying to mix up more plaster before it was needed with my hands wrist-deep in the basin and my knees standing in puddles of wet plaster in the stifling Texas-July heat. That is about the way my entire second day helping with the Stegosaurus project went. Last summer I stumbled on an amazing opportunity: getting to help construct a life-sized model of a Stegosaurus, based off the actual fossils found in Colorado in 1995. Looking back, I am still amazed I got to be a part of it. Months before, I had been trying to figure out what God wanted me to do with my life and eventually I decided I wanted to serve God like Buddy Davis. I admired the way he combined his creativity, love for God, adventurous spirit, scientific mind, musical talents, and love for kids. I never would have dreamed how quickly I would get a chance to help build a dinosaur like he does! Since I wanted to be like Buddy Davis, I figured the logical thing to do was to volunteer at the Creation Museum in Kentucky the summer after I graduated from high school. However, because of age restrictions it did not work out for me, so, after moping a bit, I decided to see what I could do to help at a much closer creation museum. Mt. Blanco Fossil Museum is in Crosbyton, Texas only about fifty miles away from where I live. It is owned and operated by creationist paleontologist/paleoartist Joe Taylor. I had been there a few times before when I was young, but I didn’t know if the museum was still open. I had no idea about the Stegosaurus project, but decided to offer to help with whatever they needed when I could be there. Because the Stegosaurus sculpture would end up living outside in Woodward, Oklahoma, she had to be made tough enough to endure storms, but not too heavy to be hauled down the highway. First, it was carved out of blue foam, using a little six-inch plastic toy as a guide by projecting slices of it from a slide projector onto huge sheets of foam. 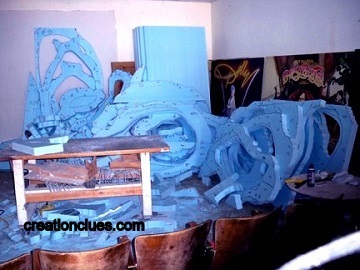 Once body sections were cut out, they were glued together, and skin texture was sculpted onto the foam model. The skin texture is in a daisy pattern, based off real fossil evidence from similar types of dinosaurs. 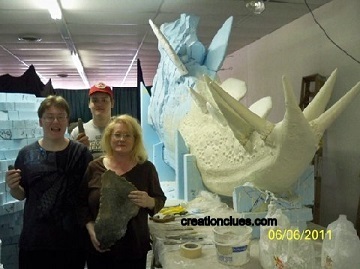 The La Coste family with the foam model and the actual fossils of the tail spike and plate L-4. These bones were found at their ranch in Colorado. However, since it was made mostly of foam, this dinosaur could not live outside, so a very large mold was made in eight large sections and several smaller sections. Each of the plates and spikes were molded individually. I didn’t arrive until after the dinosaur was molded, but I got to be there for the next step, making the cast. The molds for the four biggest sections, forming the middle part of the dinosaur, were so big I could have curled up inside of them. They were made of latex, reflecting every detail of skin and posture. Each one was placed inside a plaster “mother mold” to keep the flexible molds still while we worked. We made the final casts out of plaster, using cut-up burlap sacks in the plaster to give it extra strength. We also plastered a wood frame inside the casts. This entry was posted in Dragons, Guest Posts, Links I like and tagged creation, Dinosaur Model, Science, Stegosaurus.